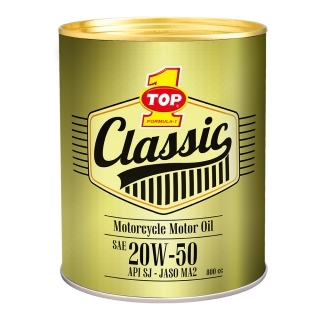 TOP 1 CLASSIC Motorcycle Oil SAE 20W-50 was created for use on all types of 4-stroke motorcycle wet clutch types. Specially formulated using base oil group 2 with purity level of 99.2%, thus preventing the formation of sludge and crust that keeps the cylinder and piston kept clean. Using the best additive formula suitable for conventional and modern motorcycle. It is suitable for motorcycles used daily in tropical climates requiring engine lubricant that is resistant to extreme heat temperatures, driving "stop and go" and busy highway. Outstanding shear stable viscosity or "stay in grade"